Goss's clumsy attempts to explain away his broken promise not to accept the political support of unions, or the fact that he unfortunately shares a campaign treasurer with indicted State Senator Ron Calderon, is duly noted. I have highlighted Noah Green's response here because it is significant. The information pictured in the inset above is from a webpage that tracks the voting records of individual Los Angeles County residents. What is showing in the screenshot is each and every time Noah voted. Between the years 2004 and 2012 Noah voted a rather meagre total of four times. In other words, and according to this website, Noah does not "always vote." Rather he votes on very rare occasions. Or whenever he feels like doing it, which is not very often. If anything, the Goss/Green postcard was about these two politicians and their struggles with honesty. Or at least that is my interpretation. Noah Green did not help himself here. Neither did Goss. Typical, actually, only votes Presidential elections, not local. By universe I assume you are talking about yourself. I think Green is of the age and school that doesn't believe it ever needs to wait or work to achieve something. You know, the privleged, everyone gets a trophy, sort of attitude. This guy comes into town, doesn't bother to vote in any of our local elections, and then expects to be elected to council? Good grief! I bet Noah still has all his soccer trophies on the shelf! goss must be running scared. There was a small (3x8) door hanger attached to my fence this morning encouraging me to vote for Goss because of his commitment, independence, and experience. Beware, the rubber band men are at it again! Nice to see that the sanctimonious friend of labor unions Gene Goss is not above using cheap illegal labor. Hey Professor! You forgot to tell people you support a 25% tax increase. Or maybe you figured your "support" wasn't helping you get elected? 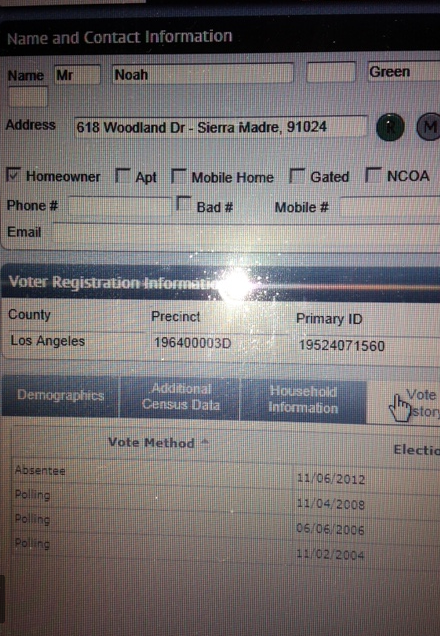 Noah Green has never voted in a Sierra Madre election. But it's his lifelong dream to be in elected office. His dream, our nightmare. Wow. Noah Green has voted 4 times in 10 years. He's a regular political activist! And then, only in the presidential elections. Its interesting that Goss has no problem being associated with Yolanda Miranda. I would have hoped that once he learned about her sordid background that he would have immediately disassociated from her. Instead he appears to be double-downing on her. I would like to know who is paying her for her efforts on behalf of his campaign? If she is being paid only by his campaign, that's one thing. If other groups want to pay for her efforts by paying her directly, that's another thing. Noah lies easily. Goss uses too many words. Why do I get the feeling that running for council in Sierra Madre is a hobby sort of thing for Noah? You know, like some men take up golf or collecting wine? Noah has really great ideas for Halloween! This year I am going to be Noah Green for halloween. I've already bought my mannequin! Apparently Noah only votes when there are elections. City Councils, school boards and local initiatives also qualify as elections. You didn;t know that? Noah lost the comments race with Nancy Walsh today. Nobody cares about Noah. Have any of you seen a more expensive or dirtier election than this one? Actually the all time spending record for a city council candidate in Sierra Madre belongs to John Harabedian in 2012.